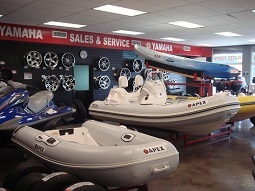 Outdoor World Yamaha offers excellent after sales service standards and a large inventory of Genuine Yamaha parts and Yamaha outboards. 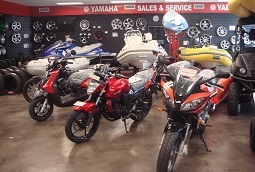 We carry a wide range of Yamaha products including 2 and 4 stroke Outboard Engines, Inflatables, Generators, Motorbikes and Scooters, ATV's, Golf Carts, Waverunners and Water Pumps. Our team of Yamaha trained technicians can service your Yamaha product either at your location or in our service centre. We are located at the airport end of Old Parham Road, St Johns and offer a great selection of hand and power tools, accessories, oils and coolant inhibitors. Specialising in the sale of Yamaha engines we stock a wide variety of models and parts including a full range of outboards from 2hp right up to 350hp, generators from 1kva to 20 kva including inverter models. Our bonded facility allows us to offer very competitive duty-free pricing on all engines in stock. Outdoor World Yamaha is happy to provide information and respond to any request by email, prior to your arrival in Antigua and will look after your Yamaha needs once here. Outdoor World is also the authorised dealer for Grady White Boats, Edgewater Power Boats, Pioneer Boats, Novurania, Walker Bay and APEX Inflatables, Eduardono sports/day boats and Aventura and Gnautic Catamarans. We also supply a wide range of new and used pleasure and fishing boats. For more information visit us or call at (268) 460-7211.